A trough runs from Punjab to Manipur with three embedded upper air circulations. Another trough runs from Marathwada to Lakshadweep. An incoming western disturbance is likely to lead to thunderstorms accompanied by hail at isolated places over the Western Himalayan states, and over parts of NW Indian plains. Thunderstorms likely at isolated places over Bengal, Bihar, Odisha, NE states and Kerala. Heat wave conditions are likely to persist over parts of Rajasthan. Thunderstorms accompanied by squall likely at isolated places over interior TN and the ghat areas, however temperatures are likely to remain well above normal over most parts of TN. Coastal TN to remain dry. 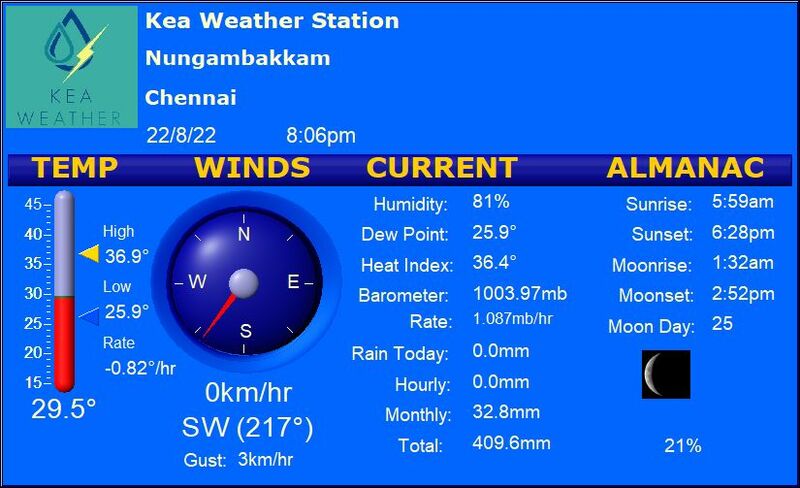 Chennai – A hot day with partly cloudy skies followed by a warm humid night. Maximum of 36 degrees and a minimum of 29 degrees. Coimbatore – Mostly cloudy sky with a chance of a late evening thundershower. High of 36 degrees and a low of 26 degrees. Madurai – Another hot day with a chance of late evening thundershowers. High of 40 degrees and a low of 26 degrees. Tiruchi – A hot day with a small chance of late evening thundershowers. Maximum of 39 degrees and a minimum of 27 degrees. Vellore – A scorcher of a day with a likelihood of evening thundershowers. High of 41 degrees and a low of 27 degrees.